Today was moving day. We were staying in the same town, just moving to another place down the street. We had so much stuff to sort out and pack. As we were packing, we had on music videos on TV. Growing up, I used to watch Total Request Live with Carlson Daley on MTV everyday after school and watch the music videos. Now the only thing I watch on live TV is Fox news before work and before bed. It was definitely interesting to see all the new (or maybe not so new) videos of Beyonce, Katy Perry, Selena Gomez, etc. They also featured a bunch of Korean pop girl bands that seem to be popular in this region. The new hotel let us check in early. The room was large, clean, and basic. We unpacked our things then headed out to get brunch. We found a small family run restaurant that had westerners so we ate there. We both got a bowl of ka nom jeen..for $1.00 each. After our meal, we went to book our snorkeling tour with a travel agent. We were already quoted a few different prices previously so I was surprised that the lady offered an incredible price without even negotiating. 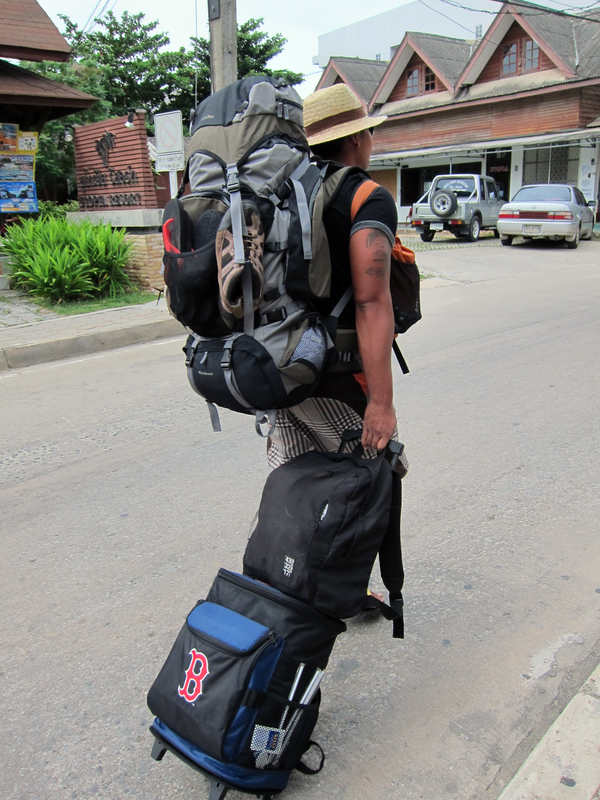 We packed our Red Sox cooler with beers, water, and "Coke Light" and headed to Lamai beach. There was an overcast today but I actually appreciated it. With the combination of the hot sun and humidity, sometimes it's unbearable to layout on the beach on a sunny day. Plus, we still have seven more beach days before we head back to Bangkok. I did prefer Lamai beach over Chaweng beach. There were much less hawkers and less people. It was definitely a more calming and relaxing atmosphere. We laid out for a few hours, read books and napped. We went back to our hotel, showered and got dressed for happy hour. Our hotel bar was offering Happy Hour specials for "Bucket Drinks", pretty much a bucket of ice, and your choice of booze (lots of it) and a mixer. We went with the local rum, Songsam, and Coke Light because it was the cheapest. After 2 buckets, we were both feeling good. We went to a Thai seafood restaurant called Sri Nuan because it had good reviews on Tripadvisor.com and other websites. We shared fried calamari, fried whole red snapper with a Thai chili sauce, crispy pork stir fry with morning glory, and baby clams with oyster sauce. Our meal cost $26.00 for three entrees, an appetizer and a rum and coke. The food was exceptional. I would like to go back but there are other places that we have on our hit list that we want to try.